Nature’s Leading Women 2017: Reflecting on our time with our PNG women. 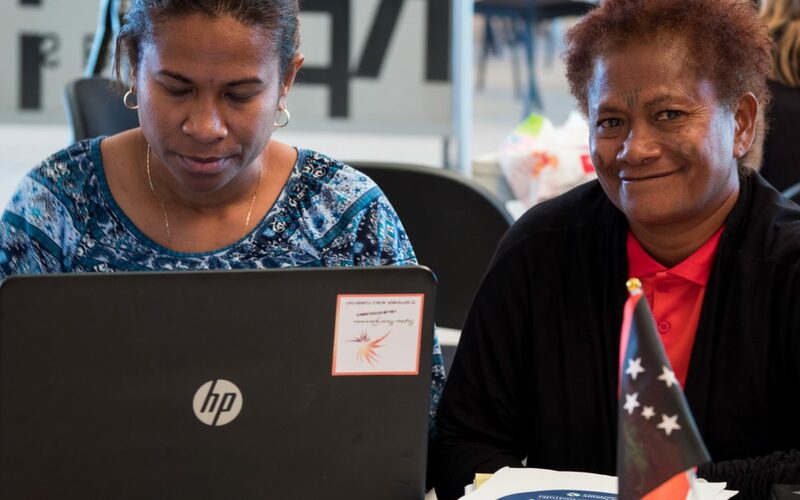 It is no small feat to gather women from all across the Pacific, and from remote Australia, and then to create a curated learning experience with maximum impact for a few short days, but earlier this month Global Sisters and The Nature Conservancy did just that. ‘Nature’s Leading Women’ is a project from The Nature Conservancy that brings together female leaders to combine business and conservation, and as Global Sisters is built on the foundation that if we harness the potential of women as entrepreneurs, we can create financial independence and start a ripple effect that flows deep into community we were thrilled to be involved. Over the next few weeks, we hope to share and celebrate the stories of each team and to share a snapshot into why we are so passionate about the work that we do, and the potential we continue to be inspired by. 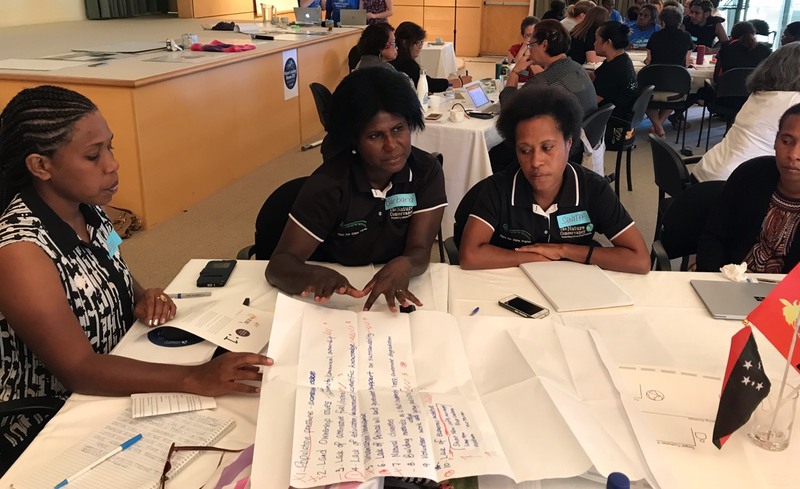 First up we have the PNG women who had the challenge of finding the ‘revenue generating piece’ that would lead to awareness, and the means, to reach their bigger dream of a blue carbon project within the Mangroves in the Manus Province. Our female leaders from PNG came to Australia with a key task in mind. They were well aware of their role in maintaining food security through food production in their Provinces as well as being acutely aware of the environmental impact that overfishing and overharvesting in the coastal Mangroves and near-shore fisheries has made to vital ecosystems. It was their heart’s work to mitigate the damage and to create change for the future, but they had a reason to look beyond conservation based projects and behaviours. Why did they needs to add economic value to their conservation work? On Day 2 of the Nature’s Leading Women workshops the women shared the heartbreaking obstacle that firmly answered the question as to why their work can not be purely based in conservation, and why a commercial and economic solution was needed. One of the women told the story of how the women had been re-planting the mangroves to rejuvenate the landscape and the ecosystem, a labor of love and a necessary role to protect their food sources. These ecosystems are destroyed when mangrove trees are cut down for housing, that happens for numerous reasons including poverty, over-urbanisation (and lack of knowledge of the vital role mangroves play in coastal protection, fish stock and livelihoods), or more overtly by larger industries, like mining. The women would spend their days dutifully re-planting with the only goal to restore what should not have been touched, and then come home to be beaten by their husbands, as the day’s work hadn’t brought home any money. They know first hand that education and conservation motives are not enough to preserve or rehabilitate the mangroves, and they know that money talks and that it is a need, not a desire, that they find a way to unlock the economic value of their mangroves. What happens when the big picture looks too big, and too far away? Whilst the idea of monetising mangroves is lucrative, and the role that the mangroves have in their ability to capture the carbon of the world’s oceans and ecosystems (a.k.a blue carbon) was viable and attractive – the actual timeline of bringing this overarching business idea to life was long, arduous, and simply overwhelming in scope. Firstly, educating more women on how to propagate and nurture the mangrove ecosystems. And secondly, promoting and supporting the mangroves and their culture through ecotourism offerings, and other product offerings that were literally hiding in the mangroves! More excitingly, that there was wonderful potential to bring these ideas to life in the short term whilst building a brand, business and recognition to the conservation problem, and empowering women through continually building their capacity in leadership. The added benefit is that this built on the existing work done with The Nature Conservancy in PNG over the last decade. Many of the women said that walking through these exercises and activities with Charlotte and Heather made them realize and write down the resources that were right in front of their nose, and also inspire them to see what was possible to grow from that moment to build to their bigger idea. On Day 3, Charlotte continued developing the customer of each group, encouraged them to explore the competitor landscape and how to use both of these skills to test the market, and differentiate your offering – and then Asja led the room through a branding exercise to give their business idea an identity of its own. The A-HA moments came flooding in thick and fast, and the PNG team dug deep and we were hearing the murmurs of product ideas and opportunities and then business names and taglines like ‘Mangrove Market Meri’ and ‘Mangrove to Menu’ started to emerge and ideas were being scribbled and discussed with such joy and passion. Big belly breaths and breakthrough moments are all a part of the process. On Day 3 the team uncovered that only one of the women was currently involved in ecotourism and that the rest were conservation so there was apprehension to go forward with that idea -and looked like a very real obstacle – if only they knew what would happen the following day as they created their action plans, and their pitch for that evening, at the State Library of Queensland. The following morning, one of the activities whilst overlooking the river and the city of Brisbane was to create a snapshot of your business key activities and really define the ‘Why’. With Mandy, our Founder, and Asja throwing questions and ideas out there, the women played and teased out ideas and then an absolute GEM popped up…. Every other attendee in the room had left for the next activity but there was no breaking of this breakthrough moment that was happening here. Apparently, they were all keen to create eco-tourism experiences, but they just hadn’t seen that it could be done in their way, in their home and that so people would be willing to pay money for that experience and that it could be as little or as big as they wanted. In the midst of this humble team was PNGs first female entrepreneur from Vilink, someone very accustomed to seeing a potential solution to the problem in the market and working hard to create a sustainable business from it. Just as initial ideas could lean on, and work into, the education and gardening programs of TNC this budding idea could also lean on the incredible knowledge, know-how and customer understanding of ecotourism in PNG. 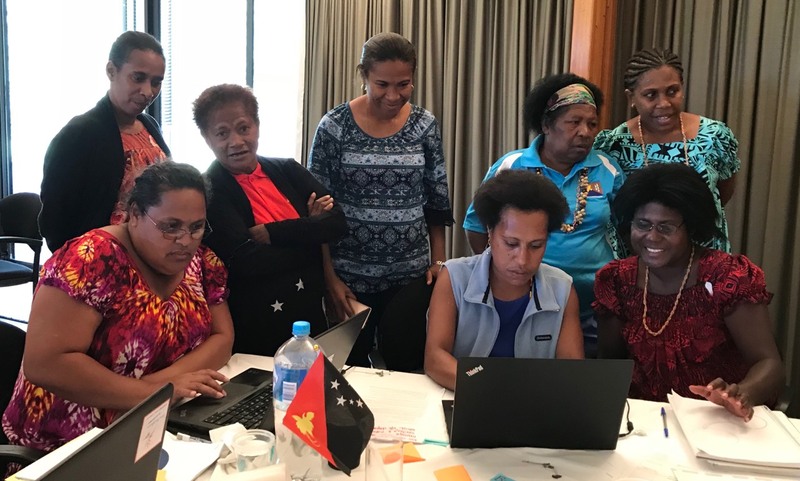 It is easy to see why this story needed to be shared, and that the best breakthroughs don’t happen on a timeline – and why the team at Global Sisters are beyond excited to continue to support these ideas to develop so you can pop them into your ‘must-do’ list on your next visit to PNG!